Apple privacy like never before. Apple privacy concerns can be a thing of the past. 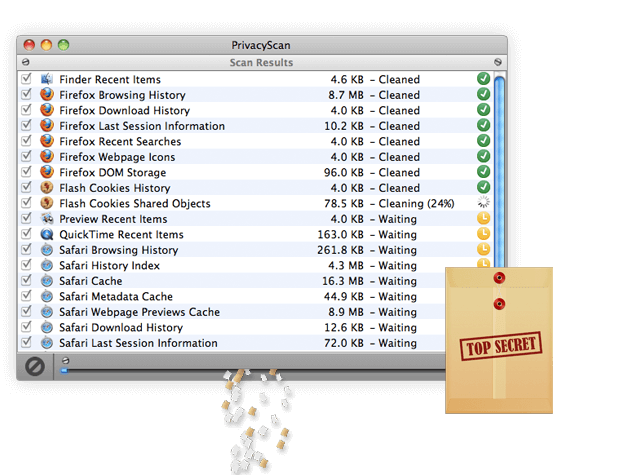 PrivacyScan securely removes files used for tracking your computer usage and online whereabouts, including internet browsing history, cache files, cookies, search history, recent items, and much more. 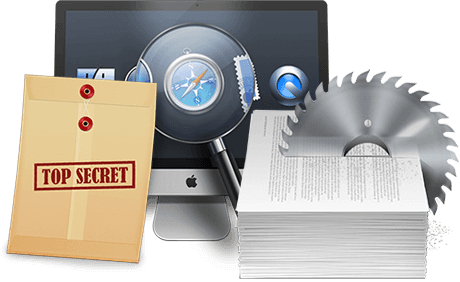 PrivacyScan utilizes advanced secure delete algorithms that meet and exceed US Department of Defense recommendations to ensure complete removal of sensitive data for your Apple computer. Private files remain private once they’re deleted. Over time, data from your web browser can fill up your hard drive and slow down your computer. PrivacyScan locates and removes these space hogs, freeing up valuable disk space and giving your system a speed boost in the process. Identifies over 100 privacy concerns. With PrivacyScan, you can destroy these hidden threats -- saving space on your system and keeping your personal information from prying eyes. Cookies are used by advertisers to build a “profile” of who you are based on your browsing habits. History files contain a complete list of sites you visit, images you view, and videos you watch. Cache files often contain full web page previews, including pictures, of the sites you visit. Setup assistant. Quick & easy. The first time you run Privacy Scan, a setup assistant will walk you through the process of customizing and configuring the program to fit your needs. Detect & discover. App detection. PrivacyScan will alert you when new apps are installed that could contain privacy concerns, offering options to detect and remove new threats. Give it a test drive. Try it for free.